I feel like I have to comment on this movie because I personally haven’t seen many people talk about it or say they saw it. I will start off by saying I am a fan of the original 5 movies that were made based on the Planet of the Apes story, yes I did say 5. While I enjoyed the attempt at a reboot back in 2001, it didn’t have enough in the story to deserve any sequels. 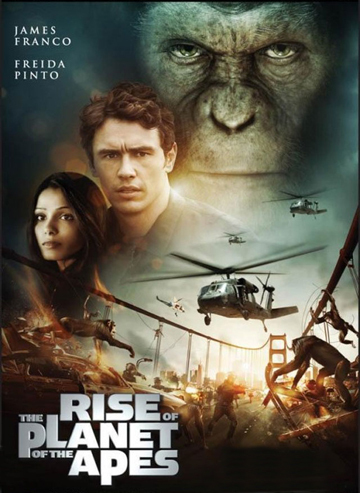 This newest film, “Rise of the Planet of the Apes” really gives a better explanation for the absolute origin of how the apes could have progressed to being the dominate species. If you’ve seen the classic films you may understand what I mean by that statement. This newest installment to the Planet of the Apes franchise totally deserves a sequel or two to expand the story and to tell parts that haven’t been told yet. The main character throughout this film winds up not being any of the human characters. Caesar, the main Ape in the film, becomes the one you are interested in. You find yourself caring about how he is treated, what life will he live and by how much will he evolve beyond a normal ape. Caesar is an amazing character and is played well by Andy Serkis who you might recall also did the acting for Golem in Lord of the Rings. James Franco is of course good, and delivers a believable scientist who genuinely cares about Caesar. Franco’s character also has a father who has Alzheimer’s disease, which is the reason for the drug testing on apes in this film, who is well played by John Lithgow. David Oyelowo plays Franco’s boss and is focused on his drug making the company money. Tom Felton who you should remember from playing Draco Malfoy in Harry Potter, plays a similarly mean spirited person keeping watch over the apes where Caesar is held captive for awhile. He’s the closest thing to a villain this movie has and he does it well. These films have often touched on civil rights issues, however they never bring them up beyond that of human and animal relations. This film sort of does that as well because you eventually find Caesar in a place where many other normal apes are kept caged, sort of like a zoo. You feel for him being locked up because you know he’s more than an average ape and he realizes his situation. Without this experience however he would know nothing about his own kind and the results at the end of the movie would never happen. I hate to ruin much more of this film because I think it is a MUST see. The movie does have a little bit of a slow pace in the first half, but it totally works because during that time they are building the characters. The rest of the film is fun and exciting. You will find yourself cheering for the apes as they rampage through the city and outsmart the humans. There are also plenty of nods to the previous films and they fit in well. I highly recommend seeing this and you do not need to see the classics to enjoy this one. This entry was posted on 08/17/2011 by Charles. It was filed under Movie Review, Planet of the Apes .